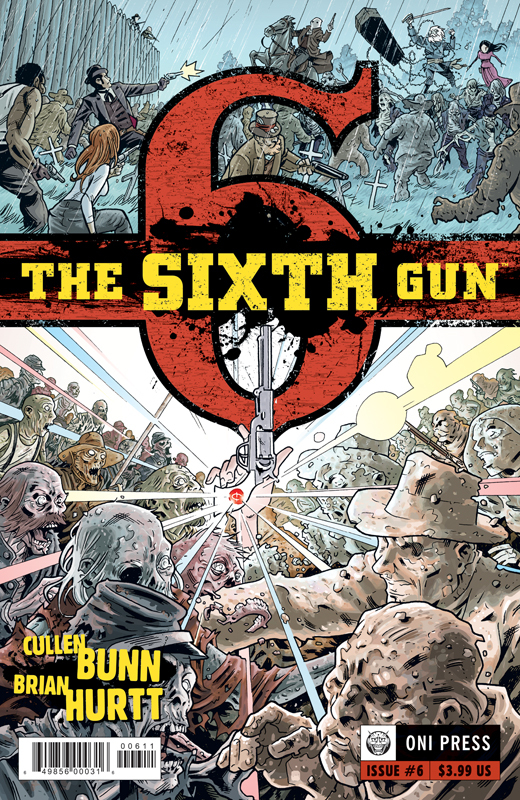 I’ve read all six issues of The Sixth Gun and kept saying, I’ll do a review of the latest issue tomorrow. For all six issues I’ve failed to do just that. And in a weird way, I’m glad I’ve waited. Taken as single issues The Sixth Gun is entertaining enough, but put together the six issues are definitely greater than their individual pieces. Written by Cullen Bunn with art by Brian Hurtt, the story centers on a possessed gun and the disgraced civil war undead general who wants to get it back. It’s a weird west tale with possessed guns that have crazy powers. It’s entertaining as all hell, but does it really stand out? I can’t say the first six issues blew me away, but I was definitely entertained. I can see how some folks would love this, and others shrug their shoulders. The characters are interesting, but I just don’t get much depth out of them. You have the daughter who wants to avenge the death of her father, the bad guy turned good, the evil bad guy who does horrible things (though we never really witness any of that) and the woman who’s in love/obsessed with him. As I said, it’s entertaining and a fun read and it might be for you, but for me I can’t quite recommend the pricey comics. For $1.99 it’s a buy, maybe even for $2.99, but at $3.99 a pop, this is only a read to me. Oni Press provided Graphic Policy with an advance copy of this issue for FREE for review.